One of the strategies utilized in this kitchen was to remove one of the only dividing walls within the house to add an open feel while not changing the original footprint of the kitchen. The existing slate floors previously installed by the home-owner were to be saved from the start of the design which presented an interesting challenge of how to update the kitchen with as little floor repair as necessary. 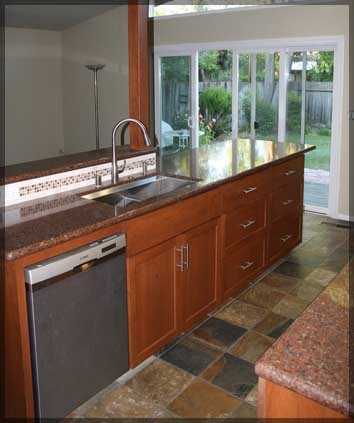 The kitchen was constructed completely out of cherry with granite countertops and custom designed tile splashes. The color chosen was a color which is custom mixed for Carey Designs (which we now call "Carey Cherry"). Existing structural support posts were wrapped with cherry to incorporate them into the overall design without the expense of removing them completely. 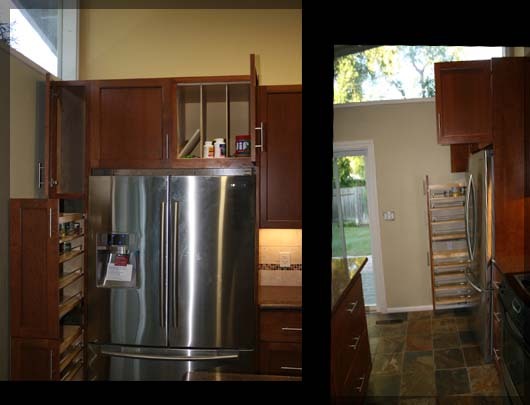 A Butler's Pantry was also added in an existing closet (to the right of the kitchen) for storage and possible expansion of the kitchen area as a whole. 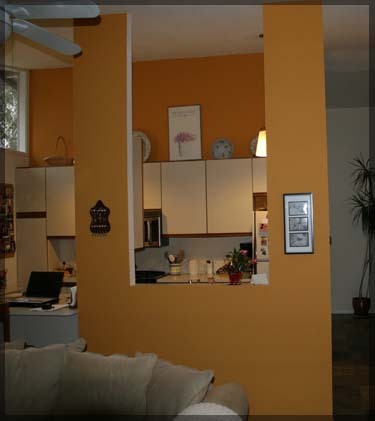 In this before picture, notice the visual obstruction the previously installed wall creates in this wonderful open space. 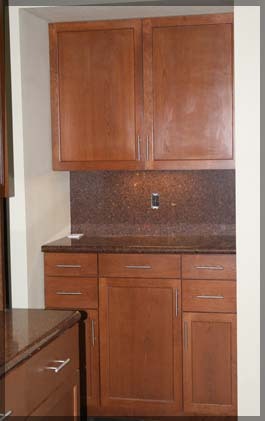 The previous Melamine cabinets had several boughs in the shelving due to their large sizes and heavy weight of items within which has now been corrected with thicker hardwood shelving installed in the upper cabinets. 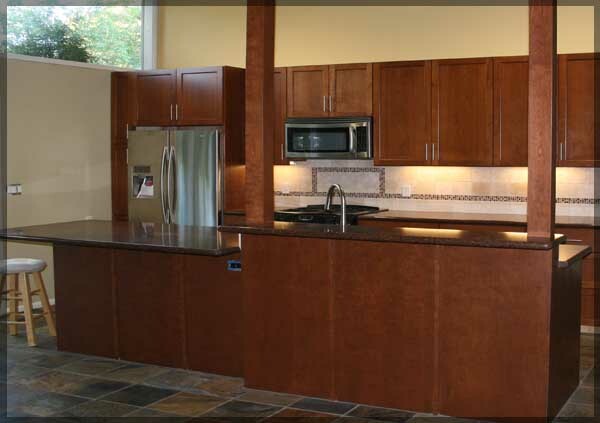 Formica countertops were also replaced enhancing the durability of the work surfaces. Due to the articulation of the refrigerator door it was not possible to place the unit directly next to the wall. The solution was to install pullout storage for canned goods as a spacing element in order the the refrigertaor to remain on the left-hand side of the kitchen. Above the refrigerator is a space for the storage of cookie sheets and larger baking pans. The divides within this unit slide completely out for ease of cleaning and also to accomidate any future changes if the spce needs to be utilized ina different manner. The costom glass melange and tile was installed by our friends at Tileco (now known as Genesis Tile). These wonderful installers were also responsible for the slate floor repairs necessary under toe-kicks and the refrigerator.